The most commonly used scripts of Arabic calligraphy today are the Thuluth, Kufi, Diwani and Jeli-Diwani, Ta'aleeq, Naskh, and Riq'ah. The Thuluth is one of the earliest and most adorable scripts. It is written with a pen, the nib of which measures one-third as wide as the nib of the Tumar pen, hence the name. Thuluth is rich, majestic, and imposing. It is considered the most difficult to master, and therefore, can serve as the best criteria in reflecting the artistic ability or a well-rounded calligrapher. The structure of this script, and the way it is laid out offer higher plastic qualities and better aesthetic treatments. It is no wonder that this script has been called �The mother of all scripts�. It has been known for centuries that if a calligrapher wants to prove his competence, he would have to be able to write an excellent Thuluth. The Kufi, attributed to the city of Kufa in Iraq, is also one of the earliest scripts. It is very distinguishable by its mathematical proportions and complex geometry, which has made it amenable to soaring creativity, and widely elevated its applications, especially on large surfaces such as the architectural installations. Because it is highly ornamental, the Kufi script is naturally attuned with the use of Arabesque in all applications from paperwork, metalwork, to pottery and tiles. The Diwani script was developed by the Ottoman Turks in the late 15 th century. According to Safadi (1992), its invention was attributed to Ibrahim Munif, and further refinement to Shaikh Hamadullah. It was originally used for secretarial and governmental purposes. It is heavily cursive and can be dramatically interlaced. The Jeli-Diwani is an ornamental variety, the development of which was attributed to Alhafuth Othman. It is distinguishable by the heavy use of the diacritical marks and dots, which fill the spaces around the letters. 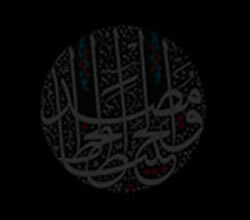 The Ottomans in Persia developed the Ta'aleeq script at the beginning of the 9 th century. It is renowned by its graceful curves, which flow enchantingly like a snake slithering through the sand. It is lustrous, glamorous and captivating like a romantic melody. Naskh is also one of the earliest scripts. It has a special air of esteem that made it so admirable to dominate the writing of the Qura'an for centuries. It has also been widely used in daily life. Naskh enjoys an optimal combination of artistic and functional characters, no other script possess. Unlike other scripts, Naskh cannot be interlaced or intertwined for it was designed with deliberate simplicity and straightforwardness, that makes it radiate with unique beauty and charm of its own. Like Naskh, Riq'ah script was designed to be simple and straightforward. But unlike Naskh, and for a reason of having even more simplicity, Riq'ah remained free from any diacritical marks. It is recognized by its compact structure with short, bold and curvy letters that often have sharp ends. Its beauty and plainness qualified it to be the model for handwriting. It should be noted here that this Riq'ah is not the same as the early Riqaa' of the six pens. These are samples of the different styles I tried over the years, including prints and children's illustrations. ©Copyright 2005, M.J. Alhabeeb. The images and text in this website are just for view. They may not be borrowed or reproduced, in whole or in part, and in any form or shape, without a written, signed, and registered permission from the author.